Nick and Julie Amsdell outside their RV, just before taking their three dogs for a walk and heading out for a day of hiking in the Daniel Boone National Forest. Seasonal work with Amazon's CamperForce plays a key role for people who spend most of their year embracing a mobile lifestyle. The young married couple giggled as they walked in to begin their shifts at work. It was license plates that got them laughing — specifically, the goofy idea that they might not even need to leave this one parking lot in Campbellsville, Kentucky to start and finish that old road-trip game where you pass the time by trying to spot cars from all 50 states. "You can play the license-plate game right outside the Amazon fulfillment center," said Julie Amsdell, 32. "You're like, 'Oh, hey, there's the South Dakota plate. There's Texas. There's Florida.'" Nick and Julie Amsdell head home with their dogs — Lexus, Cletus, and Tyler. Julie and her husband, Nick, have Pennsylvania plates. Back home, Julie was a graphic designer, and Nick worked in retail. They spent two years paying off their credit card debt, doing research, and getting everything squared away to be able to live a life on the road, with an RV as their rolling home. 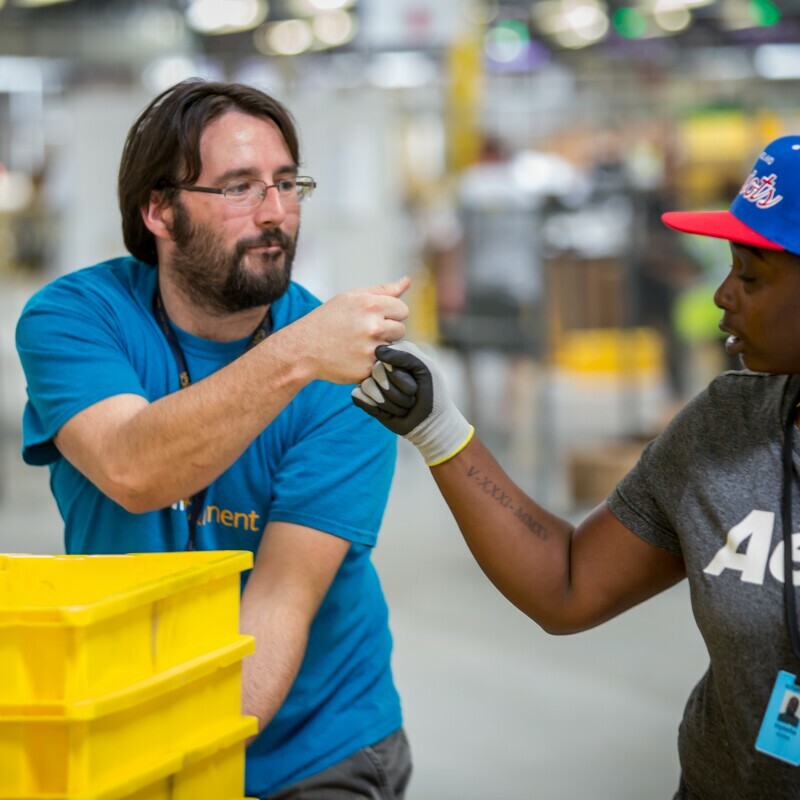 A temporary fulfillment center, or warehouse, job with Amazon's CamperForce is one of the puzzle pieces that makes this new life possible for them. "Because CamperForce offers the incredible perk of the paid campground, I can still make my mortgage payments back in Pittsburgh while we're here," Julie said. "This way I don't have double living expenses. And if we don't sell the house within the next couple months, our game plan is to get a renter in there and continue on our journey." The journey is what matters for many CamperForce participants. Each year, hundreds of them roll into Campbellsville and eight other U.S. facilities where Amazon needs to staff up to fulfill all the customer orders that come in during the months leading up to the holidays. Some use their CamperForce earnings to enhance what was already going to be a fun, adventurous ride into the sunset. "The money we're able to earn gives us that extra boost so we can take trips — go to Europe or spend extra time in Maui, where one of our daughters lives, or do whatever we want to do," said Craig Zander, who retired after 25 years as a correctional officer for the state of California. He and his wife, Lynn, have been a couple since they were students at John F. Kennedy High School in La Palma, California. Now, at 62, they're in their seventh year of CamperForce. "This is the only job we do," Craig said. "We enjoy the campground. We enjoy the people." At 62, Craig and Lynn Zander don't do any paid work except Amazon's CamperForce. They recently spent eight months volunteering in Oregon state parks. The Zanders knew exactly what they wanted most from a campground when they returned for CamperForce in 2018 — the shortest, best commute to their seasonal jobs. "From here, we just walk to the fulfillment center," Lynn said. On and off the job, high school sweethearts Craig and Lynn Zander are known for their enthusiastic dedication to wearing summer clothes in all sorts of weather. "The most fun we're having is going out in our shorts and freaking out the locals," Lynn joked, hours before snow flurries started in Campbellsville, Kentucky. CamperForce can also be a means of making the best of a challenging situation. Jettisoning a fixed address and switching to a home on wheels is one way to refuse to accept that your job prospects are limited to whoever happens to be hiring in your hometown. And for someone like 30-year-old Kelsey Howland, choosing a mobile life provided a light when she was stuck in a tunnel created by her mother's death and by the injuries her husband suffered in Iraq while serving in the U.S. Army. "He got out in the civilian world without the ability to work," Kelsey said. "There was no reason for him to feel like he had to get up in the morning. That was probably the darkest time of him feeling like he'd really lost his way. Once we got the idea of traveling and the ability to buy the camper, which is unfortunately due to my mother passing, it gave him a reason to feel like he had a place in the world. The trailer and the truck give him something that he needs to maintain and keep up and going. His sense of being is just completely different. It's been amazing for me not only to see the difference, but feel the difference. I get to relax more and enjoy what we're doing." A big part of the joy of their lifestyle is getting to raise their 2-year-old son all over America. "John Patrick has done 12 national parks, so far," Kelsey said. "We keep a blog of everything, so maybe when he gets older, he can read it and remember everything he's done." Patrick and Kelsey Howland work together to convince their 2-year-old son that he needs to wear a warm jacket to play outside during a snow flurry on a December evening at the Green River Stables Horse Camp & RV Park. "There is so much to do here that is different than where home is for us," Patrick said. "So we might as well come out here and get paid to stay here. I mean, you can't beat that." Kelsey Howland's participation in CamperForce helps her young family afford the life they want on the road. A map on the side of their RV shows the extent of the Howland family's travels. Kelsey and Patrick want to eventually settle down so John Patrick can go to high school with other kids. Until then, they'll homeschool him. It's a dream Kelsey has had going back to before she became a mom. "We love the idea that he can learn on the road, and he can learn through actually doing," she said. "If we're going to learn about American history, we're going to go to Philadelphia. He'll see the Liberty Bell. We'll go into D.C., and he'll do the tours of the capital. He can learn about geology and geography in the Grand Canyon and the Badlands." "I grew up in a naval base town," she added. "So back 10 years ago, my idea of a good life was married with kids and a government job and my own house. Everyone's usual 9 to 5. White picket fence. And now that's kind of boring. That's not where I want to be anymore." Seasonal work with Amazon helps fund the life Kelsey wants now for her family. She did her first holiday season with CamperForce in 2015, skipped two years for John Patrick's birth and infancy, and returned in 2018. A sign outside the Green River Resort RV Park in Campbellsville, Kentucky celebrates the yearly return of CamperForce. Hookups at local RV parks are free for CamperForce participants, since Amazon picks up the bill. At least one CamperForce couple stores a boat in Campbellsville to make the most of Green River Lake. This year carried an unexpected benefit for Kelsey and the other CamperForce participants. They signed up anticipating one rate of pay. Then came the announcement that Amazon was raising its minimum wage to $15 an hour. "People texted us because they saw it on Facebook or the news," said 64-year-old Joanne Perrone. "We didn't know if CamperForce was included in that or not," added her husband, Ken. "Once it was all confirmed, we were very happy, obviously." Joanne and Ken both worked for banks back in Florida. Joanne's experience was good, and she was even able to spend her last decade on the job working from home. Ken, who did computer programming for various banks, had a rockier time. "I got laid off," he said. "It kept happening every five years or whatever. You'd get laid off because the work would go overseas. At that point in my life, I said 'Enough is enough.'" He spent his final 10 years in the full-time workforce in a county job. "I was the guy who made sure the water was safe to drink in your house," he said. CamperForce participant Ken Perrone on the job at the Amazon fulfillment center in Campbellsville, Kentucky. Ken and Joanne Perrone relax at home after a shift with Amazon's CamperForce. Like the Perrones, Adria and Kenny Bunch have returned to be part of CamperForce for several years running. Both couples recommend the job to friends and to people they meet during their travels. They're accustomed to people not immediately comprehending what the work is about. "Pretty much every year when we've mentioned Amazon, people are like, 'What do you mean, Amazon?'" said Adria, a retired project manager for a computer company. "And we explain: 'You know, Amazon.com. When you order stuff, we work at their fulfillment center.'" "People are kind of fascinated by how they get their package," added Kenny, who's retired from his career as a firefighter in Louisville — about a 90-minute drive from the town where they've brought their RV to participate in CamperForce. Adria and Kenny Bunch starting the day with coffee outside their motorhome. Retired Louisville firefighter Kenny Bunch has been "trying to songwrite forever." He says his creativity gets an unexpected boost from his yearly participation in Amazon's CamperForce program. "I write so well at Amazon, I should come back here just for that." Kenny and Adria Bunch with their 9-year-old dog, Cruze. Both Kenny and Adria are 53. "Yeah, we retired early," Kenny said. "My pension, because firefighting is hazardous duty, I got to get it right away. Adria's is like a 401(k). We're waiting on it. So the Amazon work really supplements our income for the year." 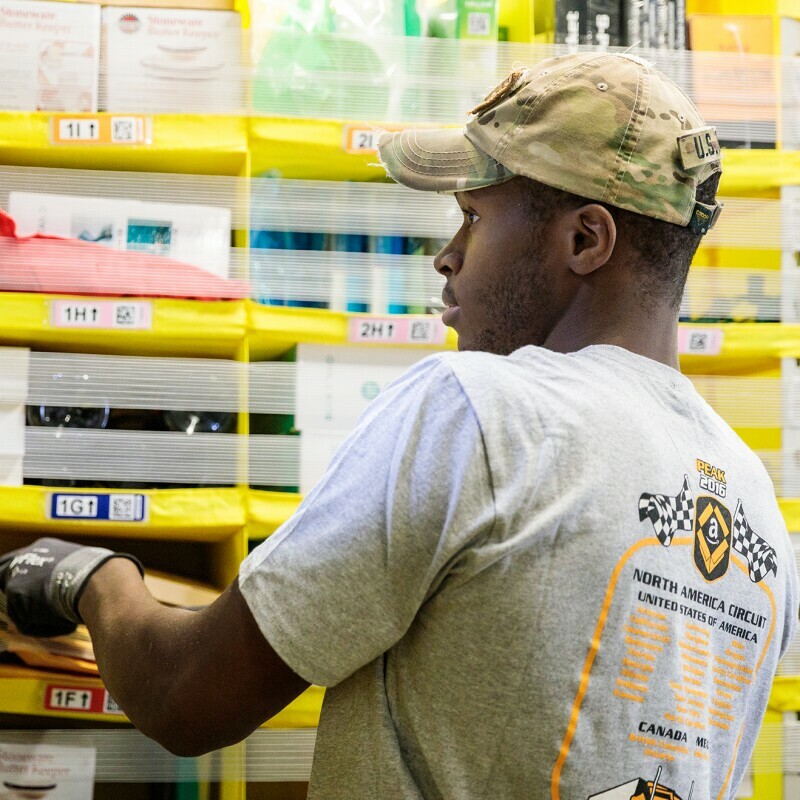 Describing their shifts in the fulfillment center, Adria said, "We'll see each other as we're going down different aisles or going to the conveyor belt or something. And we can catch up normally on a break or at lunch." "That's what it's all about for us — and, I think, a lot of couples," Kenny added. "We both had careers, and she worked a lot. She traveled. And I was, of course, gone 24 hours, 48 hours as a firefighter. So it's important for us to be together now at this point in our life. It really works out nice."